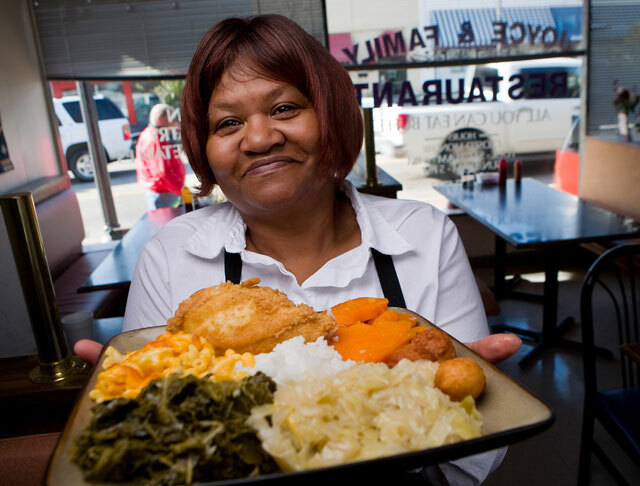 Searching for bona fide Southern comfort food? 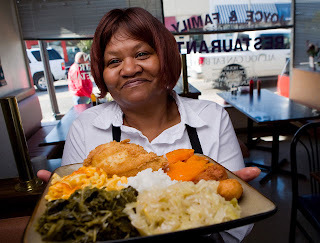 Simply visit Joyce & Family Restaurant near downtown Fuquay-Varina. The delightful and matronly Joyce Staton, a ’Quay native, recently relocated her beloved restaurant from downtown to a larger space just up the road. Candidly, some regular customers (Lunchboy included) miss the former buffet accompanied with complimentary dessert. Joyce now offers food off a menu, but at least you have the option to order “family style” (translation: people bring all you care to eat for a fixed price). At any given time, you’ll find menu selections like chicken and pastry, yams, homemade mashed potatoes, collard greens, pork ribs, baked macaroni and cheese, cabbage, hush puppies and, of course, the quintessential fried chicken. Put it this way: it’s the best fried chicken I’ve ever tasted. Period. The sweet tea is also mighty good. Fittingly, charming family photos adorn the restaurant’s walls, and the dining room features a simple mix of booths and tables. A friendly, accommodating waitstaff will ensure your drink gets refilled and extra napkins come your way. Be advised, though: The restaurant does get crowded during Sunday lunch, and the servers and kitchen staff sometimes get overwhelmed. If you still have room after the meal and don’t mind paying a bit extra, house-made desserts ranging from banana pudding and peach cobbler to strawberry cake and sweet potato pie. Joyce & Family is open Tuesday through Saturday for lunch and dinner as well as Sunday from lunch until 5 p.m. The restaurant is closed on Mondays. Watches, especially wrist watches are trusted by men and women for many generations. rolex replica Luxury watches like Panerai and IWC are the most popular watches from efficient watchmakers from Croatia and Europe. replica watches But you may think anytime there are other brands of wrist watches then why buy a Panerai watch? tag heuer replica Nowadays you will get Panerai sports watches which have unchangeable design. cartier replica Some people may even have a question in their mind as to why buy an IWC watch? This is because it includes lots with titanium covering for deep sea breitling replica diving that tells time in dark as well as in-built depth gauge keeps the divers aware of how deep they are in water.